Answer a few questions about your current steps to receive a budget for your Quick-Steps project. You can also use the Quick-Quote form below to get a general idea of costs. We service all cities in and around Minneapolis and St. Paul. 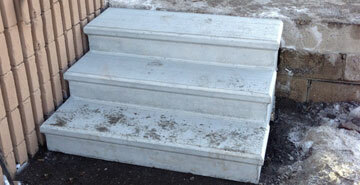 We’ll install your new steps as far North as Forrest Lake, and as far South as Mankato. Curious if we’ll install in your city? Use the form below to get a pricing estimate. Delivery fee included in estimate. For a free consultation and firm quote, please use the Free Estimate form. Quick Steps is a family business started in 1969 by one of 18 children, many of whom are still in the concrete industry today. 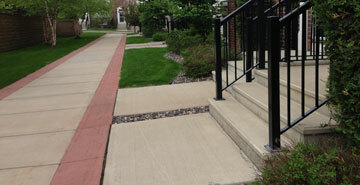 As licensed contractors, we pride ourselves on our great attention to detail. 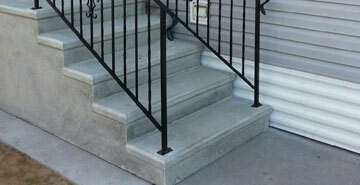 Our finishing work and the professional presentation of our steps sets us apart. 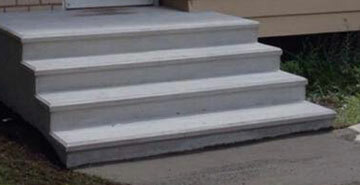 In addition to providing a variety of step, pad and rail options, we offer on-site services, such as tearing out existing steps and sidewalk concrete work. We can help save you time and money.